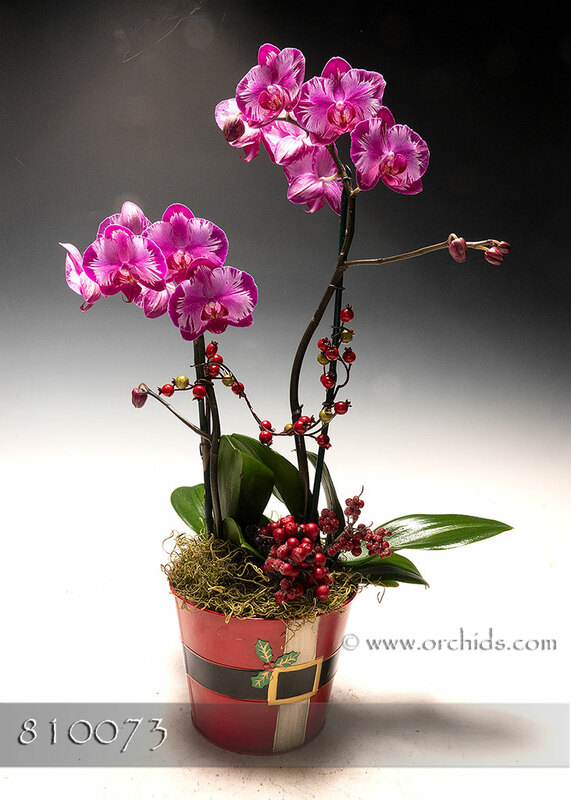 Reflecting the very newest in Phalaenopsis breeding, this exciting Gift Arrangement is sure to please even the most discriminating of Phalaenopsis lovers ! Emboldened with harlequin accents which have fused to produce a rich fuchsia central flush, its dramatic pink flowers stand out from the crowd of the more commonly available pink Phalaenopsis. Our designers will select two complimentary plants, bearing two flower spikes standing 24-26" tall and artistically arrange them in our Festive cachepot. To finish the presentation, they will enhance the flower spikes with faux vines and complete your gift with a soft bed of jade Spanish moss.